Here is my HDT's performing the disappearing act! What's hidden in the front corners, some sort of spud like TH subs? D'oh! It's in your sig. I think I may need glasses. Very, very nice. Sweet setup. Thanks for sharing Roy. I see you are also a DSPeaker Anti-Mode user. I love mine, but having gotten a taste for what it can do, I am about to demo a DEQX Mate in my system to see how it compares. Thanks Guys! I hope when you say "sick" that it's a good thing! (Grin). You were so close when you said spuds…good one. It was a lot of work building the Danley's but fun and worth it. And speaking of.... In regard to the Dsp, I could not agree with you more, Pale Rider. Even with all of my bass traps I was not happy with the bass. I am in a basement which makes matters 100 times worse, but it took all of my bass traps, the Anti-mode and the ability to adjust phase to get what I will call musical bass. Room treatments are a must have (even for the low end) but the Anti-mode works extremely well and is more than just the icing on the cake. The DEQX-MATE looks very interesting but that is a lot of money! Have you tried the Dual Core 2.0? I have not but suspect SimpliFi Audio or Underwood HiFi would give you a trial period. I heard it was used at the CES show and amazed people. It was said that any degradation caused by the preamp / digital was overruled by the unit’s room compensation. 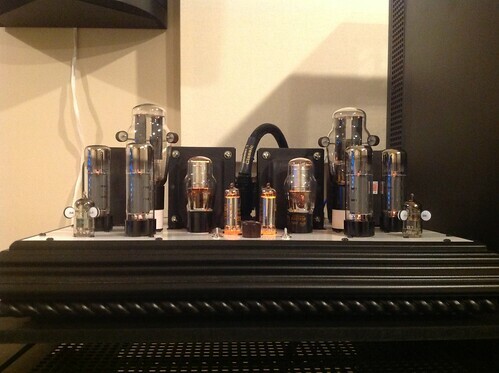 They indicated that preamp only mode did not sound quite as good as a top of the line Peachtree preamp being used at the time, but when they kicked on the room compensation the result was stunning. It goes to show that the room ALWAYS dominates the listeners perceived sound. I would have bought the 2.0 instead of the 8033 but with my setup I would not be able to take advantage of sub to main speaker phase (distance setting in my Oppo) without buying two units or one of each, and I did not have the funds at the time. Plus the thought of putting something in-between my Modwright and Torii is scary… not to mention digital. If / when I have the money I will probably try the 2.0 in conjunction with my 8033. Roy, I have the Dual Core 2.0, and it is very nice; got it from Simplifi Audio, and I have been very pleased with it. I hear good things about the combo of the Dual Core and the 8033, but in my case, the Dual Core works very well by treating the ERRs and the servo subs as a single 2.0 speaker. It sits between my 2-channel inputs and my Ultra. Although I won't be able to do any A/B/X type of testing, I should be able to get a pretty good idea of the comparison between it and the DEQX. Thanks! I work a lot and have not had a chance to look at many other folks photos and comment. It's taken me years to get mine together, to the the place it's at now. Not only does it take time to save the money (well, for me anyway) and tons of research, learning, etc., you must have the time to set it up too! Now that I have my system in a state where I don't find myself having the urge to keep spending money trying to make it better, I can say it was all definitely worth it. 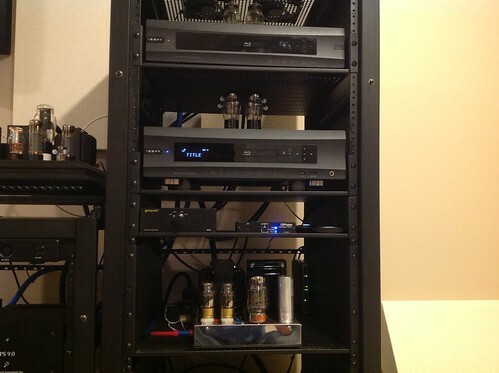 "Roy, I have the Dual Core 2.0, and it is very nice; got it from Simplifi Audio, and I have been very pleased with it. I hear good things about the combo of the Dual Core and the 8033, but in my case, the Dual Core works very well by treating the ERRs and the servo subs as a single 2.0 speaker. It sits between my 2-channel inputs and my Ultra. Although I won't be able to do any A/B/X type of testing, I should be able to get a pretty good idea of the comparison between it and the DEQX." That is awesome Pal Rider. I take it that you are happy with the two-channel result of the 2.0 room correction? 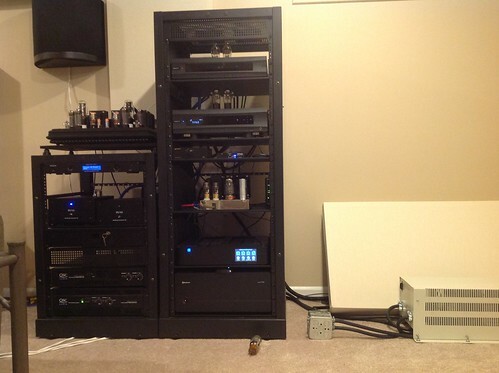 Did you notice as much difference with the two-channel as you did with your sub? Is your room treated? Hey Roy, yes, the full 2.0 is very compelling, and I prefer it to subs-only. No, my room is not yet treated. It's a challenging room, with only one true corner, a high sloping ceiling, open space on both ends of the room, and all sides of the front speakers, except for a small, free-standing wall right behind them. Getting reliable REW readings has not been easy. The DSPeaker Anti-Mode has gone a long way toward helping me understand what my room is doing to the sound. And as I have posted elsewhere, it has made the most significant overall improvement in the system. But even with the Anti-Mode, which is a very impressive device, unless one uses the parametric EQ, the effect is limited to the lower frequencies. That's mostly okay, because that's where most of the room problem is. But there is the whole problem of time and phase alignment across the full spectrum, something that involves the speakers themselves. The DEQX is interesting, because it addresses these problems first. So, we shall see. Understood and thanks for the info Pale Rider. Please keep us posted! Wow! What an awesome room Roy! The sound must be amazing ... so when's the listening party? Great looking dedicated room! Needs diffusers! Thanks for your comments! Except for my left short wall and the ceiling, my walls are all sheet rock over my concrete foundation (Man Cave is in my basement). I have thought and thought about diffusion. I spent a lot of money on the badly needed broad band & bass traps, and I could use more. When I read about diffusion I get mixed info. Left to right wall is only about 20 feet apart. I would love to put some diffusion over my traps but I can't find any assurance they will improve my room vs. making an negative impact. I have thought about trying diffusion on my rear wall and / or in my RFZ. Any / all suggestions will be much appreciated. The problem with that many absorbers is it turns your room into a black hole - and that's a rather unnatural state for sound to live in. Diffusers keep that sound energy in the room, and make the room appear to be bigger to your ears by delaying the time that reflected sound takes to get to your ears. As you've probably read, diffusers need some space to work well, so I understand your hesitation. And after living in a room that's soaking up so much broadband, I'm betting adding diffusers would take some getting used to - in fact you might find it a bit jarring to suddenly have reflective surfaces in your room. 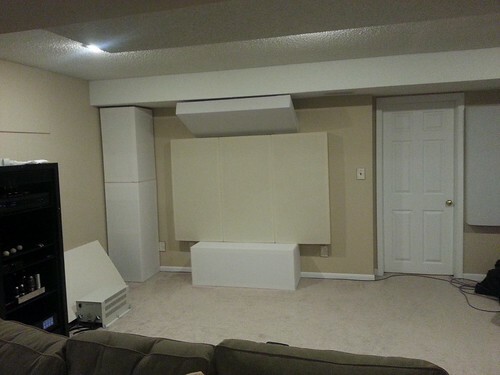 IMHO, both diffusers and absorbers are needed to get a well balanced room, but if you're happy with what you have, then that's really what matters. You're already light years ahead of 99% of the listeners out there! Added question: for two channel listening, do you drop an absorber in front of that screen to take that giant reflective panel out of the middle of your sound stage? If not, try it, you might be surprised at how it removes a bunch of smearing. Unfortunately I don’t live close or I might take you up on your much appreciated offer. My broadband traps when in a few at a time. I measured the room through the entire process and it is a thousand times better than the before. Now you have me thinking of diffusion again. You know, that’s not something I can hide from my wife like cables (grin)! Funny you mention that... I have a trap I keep just for that. I rest it on my center speaker and the screen. My wife hates it when I forget to take it down. If you look at typical loudspeaker dispersion patterns I would not expect the screen to cause issue, but you are right it does. I really thought that by treating the back wall I would need to worry about the front. It helped somewhat but it still sounds better laying one 4’ x 2’ panel across my screen. When I had my Klipch’s, I was not able to hear much if any difference covering the screen. With my HDT’s it makes quit a change. I suspect the horns had a more narrow dispersion pattern. This analogy means almost nothing to you since you're so heavily absorbed, but I look at audio like living in a room full of mirrors. If you put a candle at the front of the room and tried to concentrate on it's location (use your eyes (stereo) to figure out it's depth/location in the room), you'd be able to spot it, but it would be difficult because you have all these reflections of candles all over the place. Plus, because you have a mirror reflecting a reflection, you have that image on image on image thing going on. Now, add a *second* candle to that mess and you have image-image-image-candle-image-image-image-candle-image-image-image. That's the mess that your ears and amazing processing power of your brain have to crunch through to find the original source (candle/speaker). Adding diffusers is like tinting all those mirrors. You still have a multitude of images giving you that illusion of space, but it's easy to spot the original candle now because it's bright and shiny compared to the reflections. Absorbers are like putting black sheets on your mirrors. The room closes down and you loose that illusion of spaciousness, but now your source pops. It's why I have a hard time believing/trusting reviewers who have zero treatment in their critical listening rooms. It seems like they are working so hard to find the best system that is messed up the least by their room (though they don't seem to realize that's what their doing) and when they find something truly fantastic, it's because it happens to work well in their room. IMHO - I'd rather have a heavily treated room to neutralize the room as an issue, so I can focus on what the gear is *really* doing. Sorry, I'm rambling...and I'm preaching to the choir here - you're way ahead of the crowd since #1 your using absorbers, and #2 your taking measurements! Wouldn't we all like to have such a dedicated room....sigh. I admire you for not only having the space, but also to be determined enough to come this far. Tweaking gear is what most people do; tweaking a room takes much more time and efford. Thanks so much Nico! I just noticed in my posted photo my Left speaker is not towed in as much as the right!! Normally I would have noticed that in my sleep. I figured out early on being in my basement that room treatments were a must and that is a hard thing to do... I could have bought HR1's instead of my HDT's or now a Mystery amp! It‘s like having an awesome powerful engine. But if your transmission will not handle the power without blowing up or your tires won’t stick to the road, then you really can’t use it to the full potential. I had moved my sofa up an inch or two and everything completely changed. I kept thinking something was wrong with my system. Imaging seemed a tad better but I lost something in the top end. I found out that in my listening position my ears were partly hearing the rear of the room. 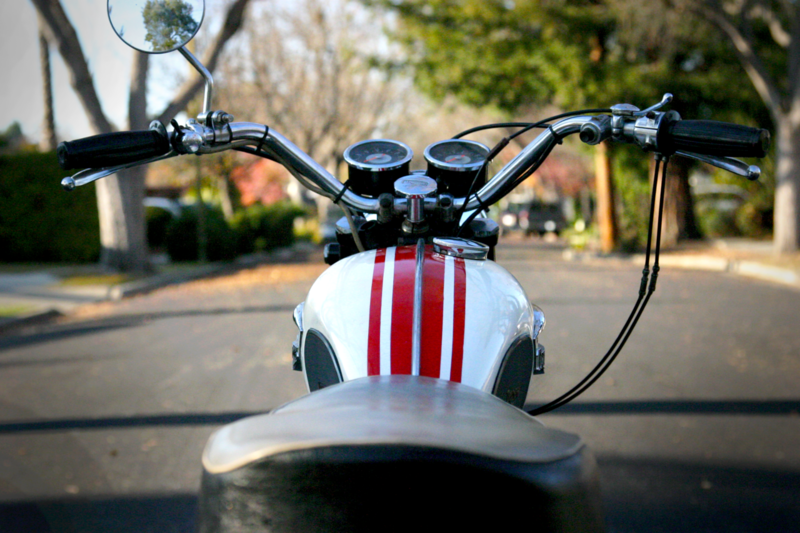 Once I was out of the rear I was hearing zero reflections. It’s interesting how moving so little made so much difference. I sold off all my home theater equipment and am working on adding diffusion. The big T.V. is gone. I am still on the fence to use QRD, PRD, 1d or 2d at my mirror sidewall reflections. If I go with 1D QRD, I will use Decwares. I have done much experimenting and reading but still undecided how I will proceed. Once I save up needed funds and make some decisions I will post photos upon completions. Thanks to all the kind comments! 1D QRD is the way to go for side-walls and front wall between the speakers, as well as back wall if you can swing that many. 2D QRD, either omnifusor or skyline for the ceiling to make it seem taller. Thanks Lonely! My thoughts were being a 2d, I would have less chance of the large unwanted concentrated reflection coming back to the listing spot. I can only assume that a 2d will have less amplitude per direction vs. a single direction diffuser. Please let me know your thoughts. Exactly, a 2D diffuses the sound in more directions, which causes a drop in perceived volume. You would think the more complex diffuser would be "better", but the truth is that it's just a different fix for a different problem. You would use the 2D diffusers where you *need* better dispersion, like the ceiling, and maybe on the back wall to help develop a surround sound like ambiance. 1D are the workhorse and can be used just about anywhere. There is less loss of reflected volume, and more predictable patterns of reflection. Roll through here, this is the ultimate in dedicated listing room. 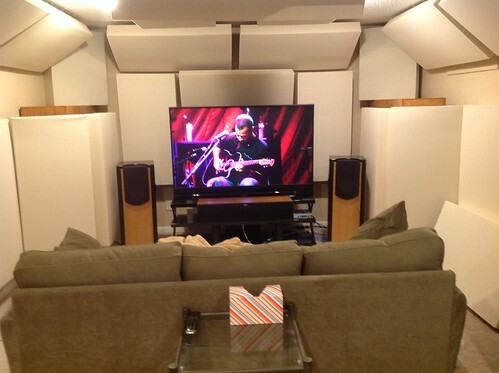 Even in this absolutely no holds barred listening room, notice that 1D diffusers were chosen over 2D. Hi guys ... Maybe I missed this part of the conversation, but where can I find the definitions for 1D, 2D, etc. in regards to room diffusers? Acoustics First Model C: 2 Dimensional / 4 Octave Diffusor is what I had in mind for my mirror sidewall reflections. It's not too deep that it will work fairly close and it has a huge bandwidth. However that was before Lonely offered his experience. I will probably end up with the units from Decware... performance / price ratio is very good compared to anything else I have looked at. 1 dimensional diffusers scatter sound left/right, while 2 dimensional diffusers scatter left/right/up/down. RPG Inc’s QRD Diffusor (http://www.rpginc.com/products/qrd734/index.htm) This is the diffuser based most closely on Manfred Schroeder’s academic work on diffusers. RealTraps Diffusor (http://www.realtraps.com/diffusor.htm) This diffuser combines the QRD (Quadratic Residue Diffusion) math from Schroeder’s work with low frequency absorption. Primacoustic Razorblade Quadratic Diffuser (http://www.primacoustic.com/razorblade.htm) The diffuser uses a sequence of depths that doesn’t appear to be strictly a quadratic residue sequence, in that it is aperiodic and the width of the zero-depth reflectors isn’t consistent. The diffuser does offer a tremendous amount of phase-complexity and probably works very well indeed. RPG Inc’s Skyline Diffuser (http://www.rpginc.com/products/skyline/index.htm) This diffuser is based on a primitive root number sequence instead of the more commonly used quadratic residue number sequence. Art Diffusor Model W from Acoustics First (http://www.acousticsfirst.com/diffuser-art-diffusor-model-w.htm) This diffuser uses both the more linear 1-D architecture with various block heights of the Skyline diffuser in a unique way. Auralex Acoustics’ Wave Prism (http://www.auralex.com/sustain/waveprism.asp) The Wave Prism uses a grid of dividers to separate the blocks of different heights which, according to Schroeder, offers better diffusion properties. Wow, thanks Roy! Looks like I have some reading to do. Without reading the links yet ~ I guess my first question is - how do you know which types of diffusers you need with your room and/or a/v gear? Are you using softwear such as REW etc. to do sweeps? I'm getting ready to move after the 1st of the year and I know there's some pluses and minuses .. first there's enough room to put my speakers more out into the room and I believe it has the golden ratio or thereabouts ... but the minuses are that it's not a dedicated space, it's a Great Room (living/kitchen/dining combined) so there are the openess factors of it, etc., etc. Here's my home-made 2D diffusor, made of the wooden blocks my sons used to play with when they were young. It works really well, solving the problems of flutter-echo's we had in the sweet-spot. Beowulf; I started with finding out if I needed absorbtion or diffusion. With two brooms holding up an old curtain we partially covered the wall behind the listening-area first; resulting in dead sound. Next we tried a "luxaflex" designed for blinding windows [don't know what you guys call it over there] and that really made a improvement. Starting with materials you find around the house , maybe moving some furniture around and a bit of imagination you can improve the sound in your living considerably. My advice; don't start with buying stuff, experiment first. Every little bit helps, especially with flutter echo.